It seems fitting that my first experience travelling to China was to Guangzhou, one of the very first cities in China to open to the outside world. This city is vibrant and diverse, and still hosts the oldest and largest trade fair in China. For a well-rounded urban experience mixed with history, ancient museums, Dim Sum, tea, and even a chance to explore an island filled with artists’ studios, Guangzhou is a great introduction to China. This guide will help you plan a 72 hour stay in the dynamic city with fun things to do in Guangzhou during your long Guangzhou layover. Guangzhou, China is an expansive port city in southern China, sitting on the Pearl River, northwest of Hong Kong. Getting to Guangzhou China just got easier than ever with new direct flights from Los Angeles and San Francisco International Airports to Guangzhou Baiyun International Airport on China Southern Airlines. Guangzhou is a port city that is northwest of Hong Kong and situated on the Pearl River, and the main airport is 17 miles from the city centre. Read about my experience flying Business Class on China Southern Airlines. For visitors in-transit using Guangzhou as a stopping point, who hold a ticket to a third country, you can enjoy a visa free visit for 24 hours or a transit visa for 72 hours to explore the city. If you are expecting to obtain a 72-hour visa it is important to be prepared when you arrive. Not only will you need the visa paperwork which you can obtain online, but you will need to show a printed itinerary of your stay with any hotel bookings and/or addresses of where you plan to stay. You will also need proof of your third country departure. Prepare for extra time at the Guangzhou airport because the visa processing/accepting process takes a bit of time. There are many pockets of Guangzhou to explore, it is the 10th most populated city in the world and according to my guide, once was considered the “New York City of China” because it was one of the first cities open to outside visitors. When time is limited it is helpful to have a local guide to guide you through the city, this made it possible for me to explore several must-see places and also venture just beyond the city in a short amount of time. Shamian Island is a unique and beautiful spot to see in Guangzhou. This island, located in the Liwan District of the city, which was divided into two parts given to France and the United Kingdom by the Qing government in the 19th century, is a reminder of times past. Beautifully preserved, it felt like walking in colonial Europe which was a surprise. The long, main boulevard flanked with ancient flowering trees and tiled pathways, mixed with park green space, was flooded with brides and their dapper grooms posing for photos with their photographers the day I visited. The pedestrian-only walk way is an urban oasis and the dabs of fluffy white floating around made it an even more surreal experience – I felt like I was in a painting. There is a Starbuck’s on this island if you are craving a creature comfort from home, and do not miss the Catholic church located just off the main boulevard which is not only the reason for so many bridal portraits taking place nearby, but it is a solidly unique finding in China. A true treasure-house of folk art and Chinese history is the Chen Clan Academy which houses the Guangdong Museum of Folk Art. The complex is the biggest, and best preserved and decorated in Guangdong with typical Lingnan architecture. There are 19 buildings in the complex: nine halls and six courtyards. The most beautiful feature of the Chen Clan Academy is the 11 carved ridges set on each of the nine halls, each carving representing a theme from famous traditional Chinese dramas. I loved watching the live presentations of folk art that take place daily, one Chinese artist painting in the traditional guohua style using only parts of his hand and fingernails and no paintbrush. It was incredible to watch him create this ancient art. I also watched another craftsman create traditional chops carving them by hand; it is possible to have a customised chop or ink stamp created for you on the spot which is a great way to remember your visit. I wandered into the gift shop between artists and other displays and found beautiful, traditional and high quality jade jewellery and other trinkets. Take time to find the Five Rams Statue, perched at the top of a tiled stack of stone steps in Yuexiu Park on Mount Yuexiu. The legend of Guangzhou is that five celestial beings in colourful robes, each riding five-coloured goats and carrying grain, arrived in Guangzhou. They gifted the grain to the residents with a wish that the land would be free from famine forever. The legend gives Guangzhou its two nicknames of Sui City or Rice Ear City and Wuyang City or Five Ram City. The statue is an impressive tribute to this legend and the city. In another park, Xiuyua Park, in the city you will find a modern tribute to the ancient Wen Di or Emperor Wen. This monument was built in 1983 after one of the oldest and largest early Han-dynasty mausoleums was discovered by accident. The tomb, with more than 2,000 years of history, was built for Zhao Muwei, buried 20 metres below Xianggang Hill and preserved perfectly in stone. The hill was being levelled to build a dormitory when the tomb was discovered, perfectly in-tact and composed of a number of invaluable rare objects including a blue plat glass panel, the world’s first set of colour print copperplate moulds and African ivory. One of the most unique things you will see in the tomb is the silk thread jade suit which has been restored to its original condition. 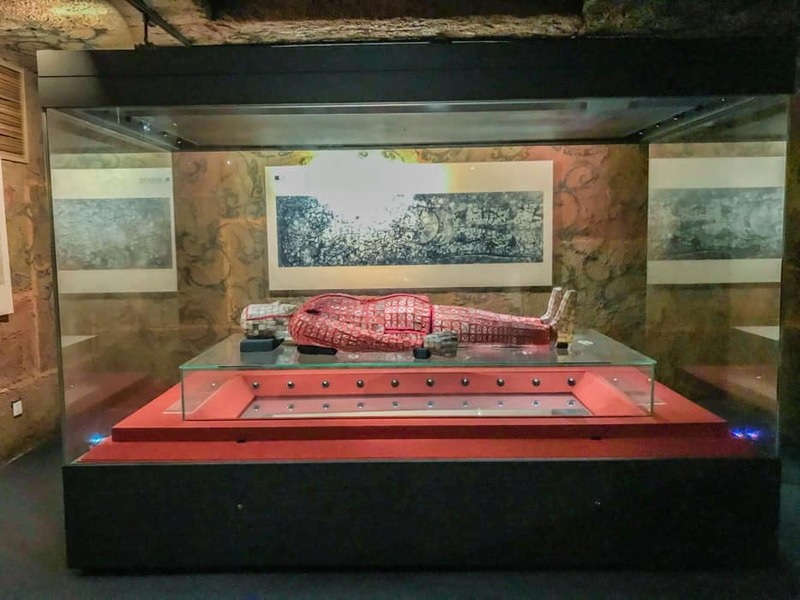 In addition to the jade suit, you can see all of the artefacts uncovered from the Nanyue King’s Tomb in this museum and it is a fascinating exploration of ancient times and Chinese culture and history. No trip to Guangzhou would be complete without a trip to the top of one of its most iconic buildings, the Canton Tower or Guangzhou Tower, also known as Xiao Man Yao or “young girl with tight waist.” Mark Hemel and Barbara Kuit, the architects of the tower wanted to design a free-form tower, one that represented the dynamic and exciting city of Guangzhou. They designed the tower to look as if it is moving and alive and the result is a feminine-looking form which is unique to other towers of this magnitude in other places in the world. This 604-metre tall, multi-purpose observation tower in the Haizhu District of the city, traditionally known as Canton, is officially the second tallest tower in the world. The elevator takes less than 2 minutes to reach the top and the panoramic views from the top are breathtaking. Also breathtaking, and surreal, is the city’s skyline which can be seen perfectly on a clear day; with its sleek modern, impressive architecture, juxtaposed with ancient temples and even Zaha Hadid’s post-modern Guangzhou Opera House that looks like a work of art situated at the base of the city’s urban fingerprint. Proving that the architecture in Guangzhou is just as diverse and captivating as the people and things to see. Just 45 minutes from Guangzhou you can find yourself exploring Xiaozhou Village, a village dating back to the Yuan Dynasty (1271-1368). Guangzhou has a total of 14 protected historical and cultural sites and the water town of Xiaozhou is one of the first with this distinction. Visiting this village was my favourite thing about exploring Guangzhou. I wandered the narrow waterway streets lined with boutiques and modern artists’ studios and felt carried away to a place that seamlessly, and almost perfectly aesthetically, blended ancient and new. Mixed in with the boutiques and studios you can find ancestral temples and even two remaining oyster shell houses, signs of the history of original Tanka people who lived there. In 2002, a Guangzhou Academy of Fine Arts professor set up the first art studio in this village that had a long-standing history of art and artists. In 2008 the village hosted its first art festival and since then artists and visitors flock to this picturesque place. Today there are more than 500 artists residing in Xiaozhou and over 20 galleries and art spaces, it is very common to see art students and artists with easels tucked under their arms or propped up along the waterways. While you visit pop into one of the local bakeries and try the sesame desserts or a moon cake, traditional Chinese desserts. Feasting on Dim Sum and sipping ancient herbal teas is what you must do while in Guangzhou, and there are many, many restaurants that allow you to explore the tradition and excellence of both. I ventured to the Liwan District for lunch at Ant Kitchen, an excellent restaurant with traditional Chinese dishes including noodles, congee, spring rolls, stir-fry with various vegetables and meats, gua bao, wonton soup, dumplings and more. This modern restaurant is situated in an art district in the city and my lunch here was the most delicious Chinese food I’ve ever had. The Fit Traveller was a guest of China Southern Airlines and Tourism Thailand for our recent visit to Thailand. As always, the opinions, words and images are authentically our own. Pat Bailey is a certified Bhakti Yoga Teacher, published poet, writer and entrepreneur with a passion for exploring the globe. Pat is also the founder of The Hell Yes Life, where she has created her own branding academy helping to elevate brands and students through authentic and intuitive coaching.